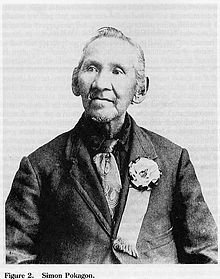 Simon Pokogan (1830-1899) was born in Berrien County, Michigan, the son of Leopold Pokogan, chief of the Potawatomies for more than 40 years. In 1832 Leopold, some believe, actually sold the land some of early Chicago was built on. Simon attended Oberlin College for a year and Twinsburg Institute, near Cleveland, for two, then served as chairman of the Potawatomi business committee. A controversial middleman figure to his own people, Pokagon on the one hand advocated for the Potawatomi community, often elegantly expressing the Native sadness of displacement and castigating whites for usurping their land. On the other hand, he seemed a tireless self-promoter and was criticized for, among other things, selling the tribe’s interest in the Chicago lakefront by way of quitclaim—an echo of his father’s earlier sale?—and too readily acquiescing to white demands. 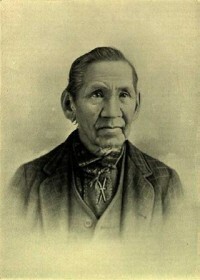 Nevertheless, Simon Pokogan is an important early Native American literary figure, often referred to as the “Indian Longfellow” for his many poems. He is also usually credited with being the first Native American to write a novel about Native Americans, Queen of the Woods/O-Gi-Maw-Kwe Mi-Tig-Wa-Ki (1899), though some scholars believe it was actually ghostwritten by his publisher, an indication of how he perhaps allowed himself to be used by whites promoting the noble savage image. “Disguise the fact as the pride of the white man may,” he writes, “when he joins hands with unaltered savages in warfare he is a worse savage than they,” then accuses the white man of making the Indian worse. “All our traditions and the accounts published by the dominant race show conclusively that the white man’s dealing with our fathers was of such a character that they were made worse.” He recalls his father Leopold’s belief in the enormous corrosive effect of “fire water.” It is an impassioned defense. Yet even here his references to “unaltered savages,” his admission that Native Americans were “made worse,” and the way he often seems to identify civilization with whiteness—all these lean towards confirming that Native Americans may indeed be less worthy. He also seemed to think that his appeals could break through the “pride of the white man,” something that history has amply proven otherwise. 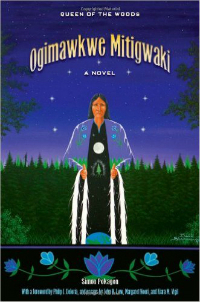 ♦ Read about other Native American writers and artists: Metea, Mark Turcotte, Ramson Lomatewama. 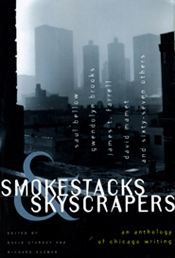 ♦ Go to a list of Chicago Writers, most included in Smokestacks and Skyscrapers. This entry was posted in Chicago Writing and tagged Fort Dearborn massacre, Potawatomies, Queen of the Woods, Simon Pokagon, Smokestacks and Skyscrapers: An Anthology of Chicago Writing, World's Columbian Exposition. Bookmark the permalink.